Adventure Cruise vs Traditional Cruise: What's the difference? Adventure Cruise vs Traditional Cruise: What's the difference? I have never been a cruiser. Despite my love for the water, the thought of packing into what is essentially a giant floating hotel always made me queasy. Not to mention, I am also quite prone to seasickness. But when my grandfather, who had spent most of his life working, raising his family and taking care of my ill grandmother, wanted to go on an Alaskan cruise, my family packed our warmest clothes and headed north. While I treasure the time I spent with my grandfather, the cruise itself was just for not me. So when I got the opportunity to go on an Adventure Cruise in Greece, I was a little skeptical, but I went anyways, and I’m so glad I did. 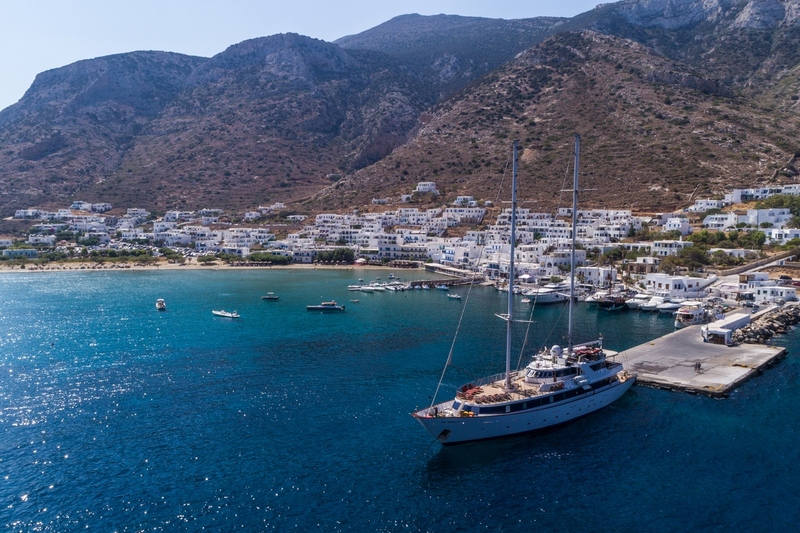 My 8-day cruise through the Cyclades was immensely different from my previous cruising experience, not only because the weather and the scenery in the Greek islands were a tad different than Alaska’s, but because being on a small ship offered me the personal service and local experiences I just didn’t get on a big ship. 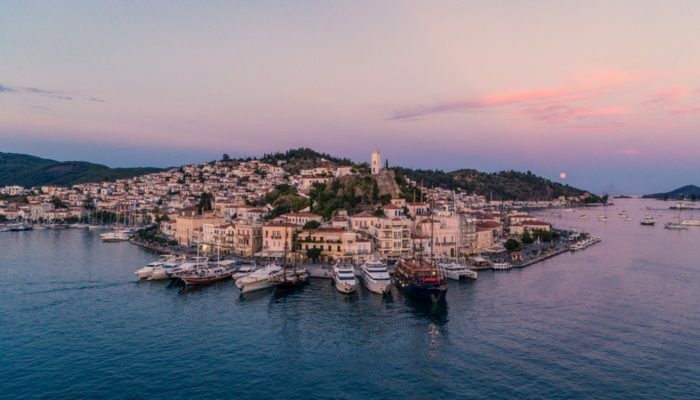 Here’s how an Adventure Cruise in Greece turned me from a cruise-hater to a cruise-lover. Travellers exploring Syros on a day in port. On the Alaskan cruise, many of our days were all about life on board. Whether it was taking in the on-board performances in the theatre or trying your luck at the casino, our only opportunities to see the country we were travelling in were the on-shore excursions, which usually occurred once per day for a few hours. On my small ship adventure cruise tour, we only sailed at night. This meant we would wake up in port and could go on as many excursions as we pleased. 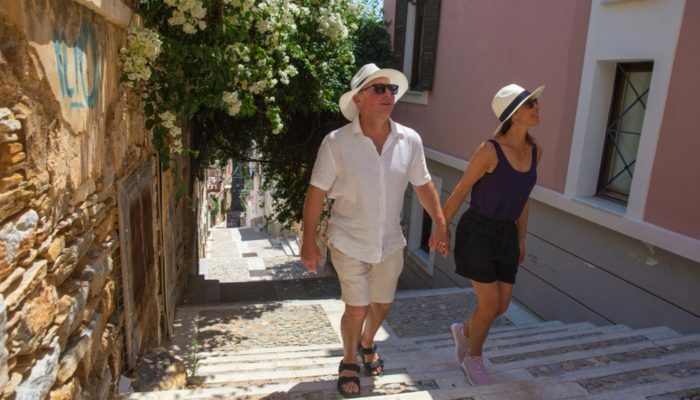 Instead of long days on the water watching questionably good theatre, we spent our days ashore exploring quaint neighbourhoods under the guidance of our local leaders, relaxing on beaches, visiting churches and trying local delicacies. And the only on-board entertainment came in the form of backgammon games and good books. In addition to maximizing our time in port, being on a small ship meant that, unlike the big ships, we could pull right up to the small marinas. Travellers on ships that were too large to dock in port had to drop anchor further out and wait on water taxis to shuttle them to shore, whereas we could go ashore on foot, and come and go as needed. A swim stop on an Adventure Cruise. OK, so this one is not applicable to cruises in Alaska, but in general on large cruise ships, you’ll have a swimming pool on board. But when you’re cruising through the Greek islands, I can’t see why anyone would want to use it. 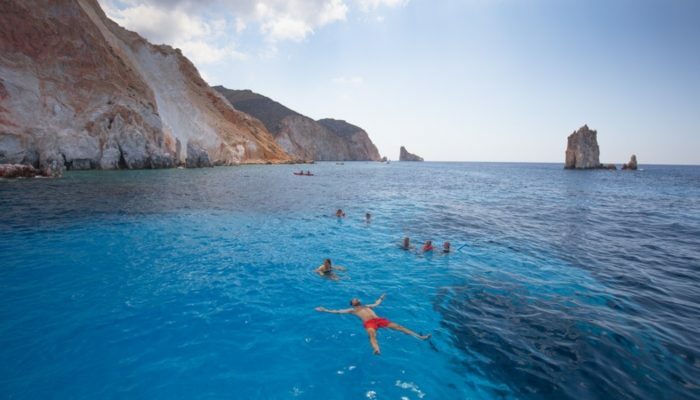 It must be awful to be constantly surrounded by the bluer than blue water of the Aegean Sea and not be able to dive right in. Our swim stop was one of my absolute highlights of the trip. The winds had picked up and we were told it might not happen (customer safety is always Peregrine’s first priority), but – most likely after seeing the distraught looks on my fellow travellers’ faces – the crew found us a sheltered bay in which to drop anchor and swim. When I was cruising through the pristine waters up in Alaska, I couldn’t help but feel guilty about the amount of waste and pollution the large cruise ship was inevitably creating. Adventure Cruising with Peregrine made me realize that it was, in fact, avoidable. With no single-use plastic on board the ship and carbon-offsetting every trip (that’s every trip Peregrine runs, not just Adventure Cruises), it was truly a more sustainable way to see the world. Some of the best grilled octopus I ate all trip, made by our on-board chef. There’s no denying that big cruise ships tend to have enormous buffets with a huge variety of choices, but I’ll take a small amount of good food over a huge amount of mediocre food any day. 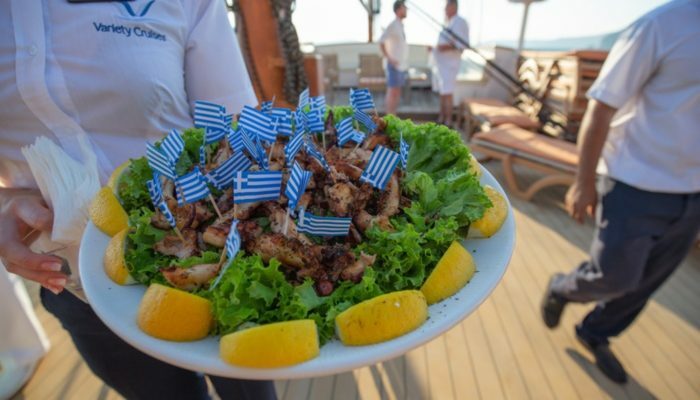 Every day on board the Adventure Cruise, our chef and his crew would prepare us delicious, fresh food. They made an effort to include at least one authentically Greek dish in every meal, and since Peregrine ensures 90% of the food is locally sourced, the flavours were fresh and authentic (and your trip is more sustainable). Conversely, on my Alaskan cruise, I remember returning from an excursion in a fishing town where we toured an old salmon cannery and learned about fishing techniques. Then, at dinner, we sat down to a menu stating we’d be enjoying Atlantic salmon. In a salmon fishing village. In Alaska. 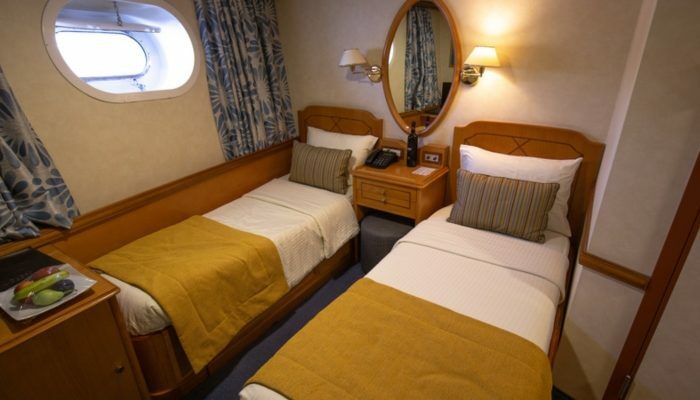 A lower deck twin room on board the Panorama II. Our ship, the Panorama II, was more akin to a luxury yacht than a cruise ship. It was just big enough to feel like you had some privacy but small enough to feel cozy. The big cruise ship I was on had such useful areas as a basketball court, a casino and about 18 different bars all serving the same drinks. I can say with certainty that one bar, one lounge, two dining rooms and two sun decks on board the Adventure Cruise ship were more than enough. The staterooms were better than those on a traditional cruise ship as well. Despite being on the lower deck, my room had an actual porthole that let in natural light, a TV, a mini-fridge and a small but practical bathroom. Even more luxurious than the facilities was the level of service we received. From the bartender who knew my name by the end of the first day (not sure if you want to read anything into that) to the server who knew that I needed at least five refills of our tiny coffee cups before I was ready to leave breakfast, I felt like the crew truly made an effort to get to know everyone. Our ship docked right in port with smaller yachts. “We have good news and bad news”. Not exactly the first words you want to hear out of your leaders’ mouths. The bad news? There were some heavy winds coming from the direction of Mykonos so we were going to have to alter our itinerary to accommodate that. The good news? Since we were a small ship, we had the freedom to change our course fairly easily, and our captain was going to ensure we had a trip that was safe, fun and would minimize seasickness. We put our trust in the captain and ended up only missing one of our scheduled stops. In return, we got a significantly less choppy and significantly more customized tour of the Greek islands, including two new islands that weren’t originally included! Our group was also able to customize our time on shore by breaking into smaller groups based on interest. For example, one day in Syros, one group wanted to hike to the church on the hill and the other took private taxi transfers. 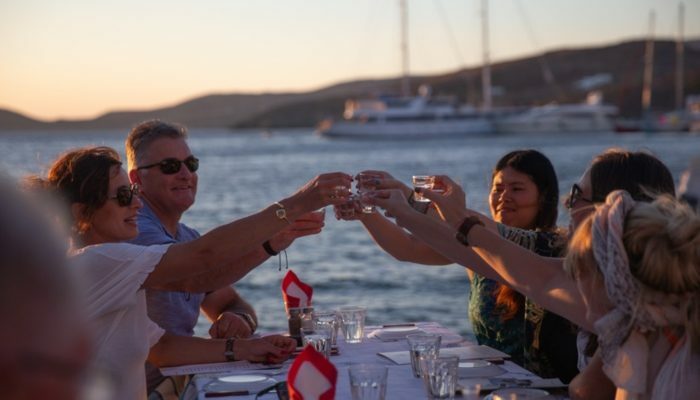 Enjoying a sunset dinner (and a shot of raki) with fellow travellers. On traditional cruises, if you want to go solo, you could be paying up to double the fare of someone travelling with a friend or partner. If a boat is the best way to see a place, this has long been a deterrent for solo travellers to take a cruise. On an Adventure Cruise, however, solo travellers have the option of not paying extra and sharing a room with another traveller of the same gender. But if you’re the type that likes to walk around in your underwear or just needs some alone time, you have the option to pay a small single supplement to get your own room. On my trip, about a third of us were solo travellers. The setup of the ship really worked for us, with a few small communal areas where it was easy to socialize, and no assigned seating at dinner so we could get to know all our fellow passengers. Our whole group of like-minded travellers. 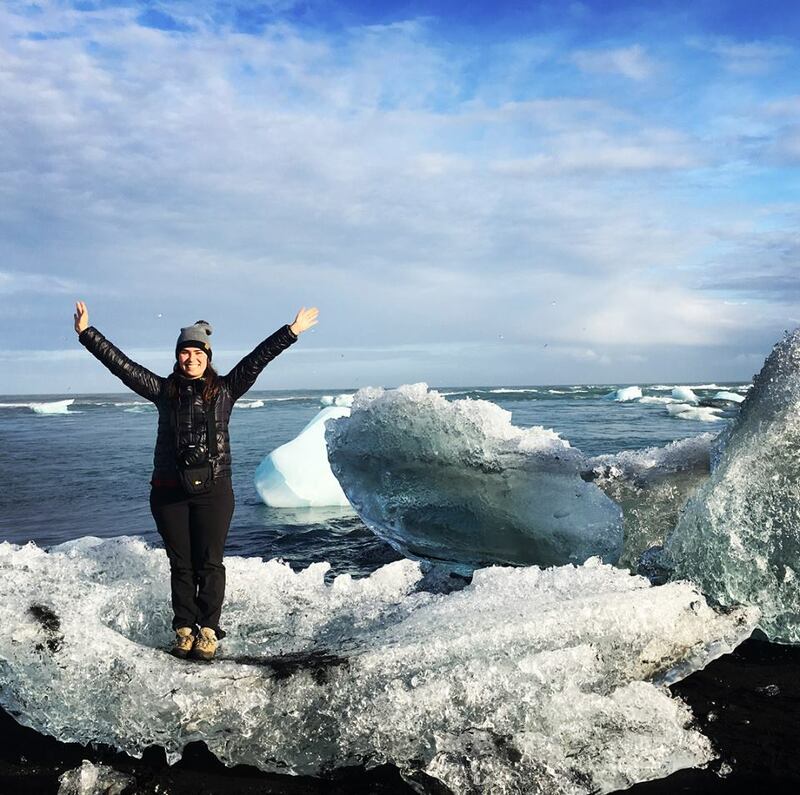 Putting aside the facilities, the staff, the ship and the food, perhaps the best part of taking an Adventure Cruise rather than a traditional cruise was the people. 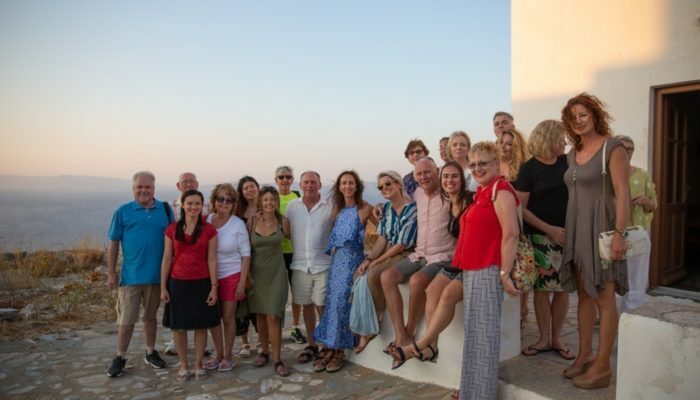 Although we ranged greatly in age (from late 20s to early 80s) and travel experience (from their first international trip to their third time visiting Greece), we all had that same spirit of adventure and wish to authentically experience a country. And exactly zero of us would have rather been sitting in an on-board casino all day. Want to experience a small ship cruise for yourself? Browse our full range of Adventure Cruises here.